Attractive in-store displays are a great way to grab customer attention and promote impulse buying. In fact, studies by POPAI (Point of Purchase Advertising International) revealed that about 70% of all brand purchase decisions are made in-store. Oftentimes, it’s a great idea to add an advertising POP player to your display. An advertising player is an actual media player on an LCD screen. It allows the consumer to interact with the product, understand your brand’s story, and learn about all of the benefits and features of your product. It also allows the consumer to be in a place of immediate control where they can explore the ins and outs of the product right then and there ‐ saving them time and in turn, increasing sales. For instance, the advertising player may have a touchscreen process that explains each part of the product in detail. If the individual picks up your product and sees something they have a question about ‐ they don’t have to call a customer service number and waste time trying to get ahold of someone, or spend time sifting through a lot of information on the internet to try to address the one specific question. The consumer can pick one specific category on the advertising player, and go right to a unique & engaging page that is solely for that category. The individual can then decide if they want to look further into it or if they are done. Advertising players are a one-stop-shop. When the consumer’s answers are immediately answered, doubt is erased and it frees the consumer up to move into buying action, bringing in more sales for you. Instructional video: The consumer appreciates this video because all questions can be answered right then and there. An instructional video can be a detailed, step-by-step educational video on how to use the video. It can also be a brief overview on how to use the product and what it is. Or it can be a simple overview, highlighting the benefits of the product. Sales Video: This video can either feature a person speaking to camera about the benefits and features of the product, or it can be product pictures with animated bullets, highlighting why this product is necessary for the consumer. The options are endless and the results are solid because the consumer is automatically engaged. Testimonial Video: This is a great way to build the consumer’s trust through other individuals’ stories about the product. The consumer is able to understand the brand and durability of the product through real life testimonials. This foundation of trust is key to moving forward in the buying cycle. Having an advertising POP player on your point of purchase display is like having your own personal salesperson in the retail environment. Advertising POP players are programmed for motion sensing. When the consumer walks by the point of purchase display, the advertising player can play music or speak to individual. This immediate selling is key. It connects the consumer to the product in a more personalized way, having an emotional impact on the consumer ‐ which is an area of the buying process that is rarely utilized but highly effective. The use of media and interaction is increasingly popular, and there is a reason for that. It connects people to people and people to products by allowing the user to engage in a more human way. An advertising POP player allows you to utilize that social aspect. Our first-hand experience with the retail business puts us in a unique position to understand your advertising needs and help meet your sales objectives. Our award-winning design team offers fresh, original ideas to attract your customers. We will work with you on your point of purchase display and decide what would be best on the advertising POP player to best compliment the display. We do everything factory direct ‐ meaning you receive a low price with excellent design. Our team of creative designers will work with you to achieve a solid advertising POP player that ties your display together. With custom branding specific to your products and target audience, and competitive pricing, your consumers will know your product better than ever. By creating a whole package that tells the story of your brand and allows the consumer to interact with the product, consumers will be attracted to your product and want to know more. 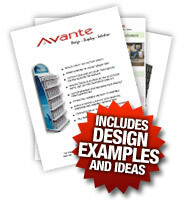 With years of experience, Avante can deliver a great advertising POP player to enhance the in-store consumer experience. Call us today and see how your company can benefit from state of the art wall POP Displays with integrated advertising players.